From a Yellow House : HAPPY HALLOWEEN!!!!!!!!!!!!!!!!!!!!!! Hey, my Dear friend Dori, how are you doing? Just visiting and noticed your Halloween image post. We don't celebrate Halloween here in the Netherlands. But since I do have virtual fiends from all over the world, for years now, I got a nice virtual Halloween card from a friend in Australia, every year again and again I get a card from this friend. Enjoy the Sunday, here we moved the clock one hour back last night and from today on the winter time has started. I hopew that you and the Brit Boy had a great halloween. hope you are doing well. happy november. Love your picture! Dropping by to say hello to one of my favorite bloggers. Hope your day was spooktacular. I hope you had a great Halloween. Did you celebrate? I'm doing fine. How are you? 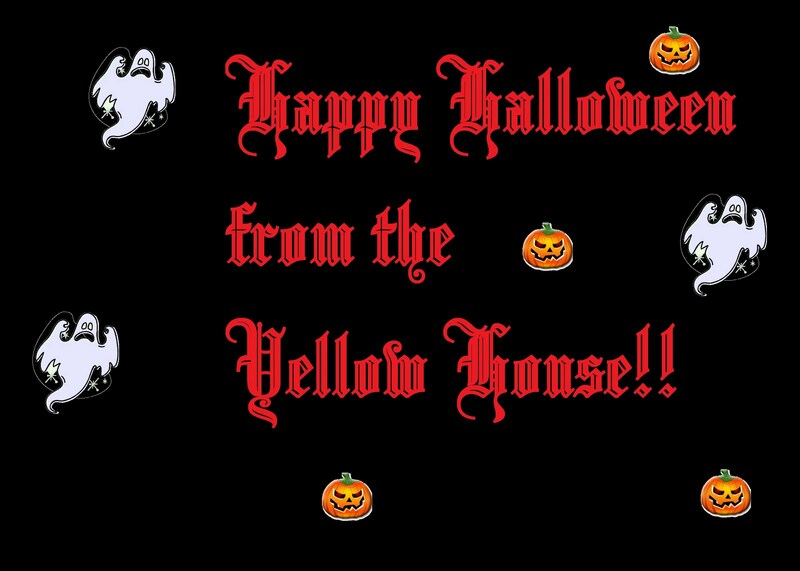 :) I think it's so cool that you get a virtual Halloween card. That's what I love about the online world...all of these opportunities to share and connect! It was great! Yep, we had fun. We enjoyed lots of scary movies and way too much candy. LOL. I hope yours was great!